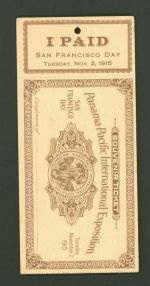 The Panama-Pacific International Exposition (PPIE), held here in San Francisco in 1915, was a World’s Fair that brought in millions of visitors from all over the world to celebrate the opening of the Panama Canal and San Francisco’s recovery from the 1906 earthquake and fire. Through December, the San Francisco History Center joins the City in celebrating the Exposition’s hundred-year anniversary. Need a good PPIE read? Or browse, view, and download our digitized PPIE books on the Internet Archive. For archival highlights, program coverage, and exhibition previews and out-takes, see our blog, What's on the 6th Floor? Visit the San Francisco Historical Photograph Collection's PPIE Page for links to thousands of digitized photographs, plus tips about discovering PPIE-related photo albums, photographic prints, stereographs, and more! Visit ppie100.org, where you’ll find PPIE-related exhibitions and events throughout the San Francisco Bay Area and beyond. SFPL is proud to be a core partner in this consortium project.